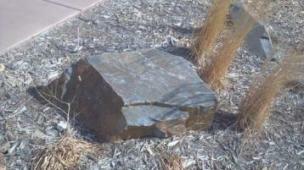 Landscape boulders are used in a variety of ways from accent pieces in a landscape setting, to the construction of a waterfall or streambed. Most boulders range in size from 12" to 48" in diameter. They can be either round and smooth or a "jagged" quarried stone. 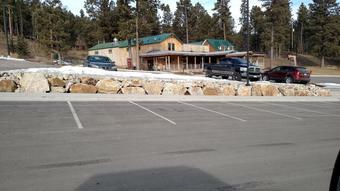 A Harney Peak Granite with a natural weathered look. Most are speckled with a natural moss vegitation. This gray trap rock is found in the beautiful Black Hills. It has a natural crystal-like look with straight seams & faces. Most also contain natural tree-like denderites. Autumn Flame is an iron oxide stained slate. 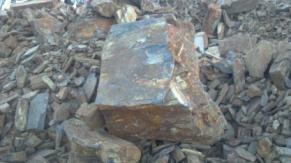 Mined by Dakota Stone, in the Black Hills, its has reds, yellows, grays, and browns. Slate if formed in elongated crystales. The shape is nice for stacking or just an accent boulder. Available in any size. Our Moss Rock boulders are solid granite with good landscaping shape. We also have sandstone Moss Rock for pond building and wall stacking. Red Feldspar is a beautiful dark salmon color with quartz, tourmaline, mica, and beryl. Each piece is a unique mineral speciman from the Black Hills. Used to brighten any landscape design. Available in all sizes. Light colored Mica Schist works well to brighten any landscape. The Mica in the stone reflects lights, making it appealing for driveways or roadsides. Rose Quartz is a semi precious stone mined in the Black Hills by Dakota Stone. Graded in color: A grade, B grade, and landscape boulder. Gold Creek is a layered quartzite that is golden tan to a light gray with a small amount of mica imbedded well into the surface. The shape is flat. It works well to stand for signs or monuments. Good for stacking large stone retaining walls or accent boulders. Available in all sizes. Petrified Wood is a semi-precious stone. Each piece being very unique. Not available for large orders. Sold by the piece only. Call for availability.